the desert. Ok...I'm sorta lying about the desert part, not so much about the shimmy-ing part. You may or may not have noticed that "Giveaway" was part of this post's title. the business of blogging. Not the business of daily sweepstakes! appreciation for all the love, I have lined up 3 amazing giveaways for the month of July! First up? This Jennifer Haley Stroll Jumbo Fringe bag valued at $550! Holla! Thanks for this giveaway girl! I liked Jennifer Haley on FB and now follow on Twitter. What. The. WHAT???? Sign me up, woman. Liked Jennifer Haley on FB & Twitter. Here's entry numbah two. Follow FHF on GFC. Duh. Following FHF on Twitter. Thanks for the opportunity! I liked her on FB & am following her on twitta! i love your look so much.. its awesome.. I love those shorts - how cute is the print! I'm gutted I can't enter but good luck to those who can - the bag is stunning, such a beauty. I've liked Jennifer on FB! I don't have Twitter so please don't discount me! I follow you on GFC (of course)! I need another bag like a hole in the head - but common a girl needs one in every style!!!! And done and done!!! And OF COURSE on de twittas! Such a great giveaway! I liked Jennifer Haley on Facebook and I already follow you on Instagram! Such a great bag and boot combo-love these photos! I liked (loved) on Facebook and Twitter! I have wanted a fringe bag FOREVER! Thanks for the awesome giveaway and your awesome blog! Crossing my fingers that I win! I liked on Facebook and Twitter! I also follow FHF on twitter! Such a great bag, I LOVE YOUR BLOG! Love this outfit, the shorts are so awesome!!! I love your outfit Nicole and am totally jeally of those Rag and Bone booties. Hope you had a great weekend! Following on fb and twitter babe! I passed up a fringed beauty similar to this at the Long Beach Flea last month (thought she was a bit too $$) and have been regretting it since!! I NEED this bag in my life! That fringe is too delish! Also following you on GFC love! I liked Jennifer on FB and FHF on GFC. You look gorgeous... and I love this bag! Perfect laid back CA chic. I love your blog! Just "liked" Jennifer Haley on FB. I liked Jennifer Haley on Facebook! i love the hat and the fringe! Those shorts are ever so cute! And I love the blue hat. nice bag, i like it! I like JH on FB and follow on Twitter (Amy J.... and @chknpotpie). And finally - I follow you on twitter (@chknpotpie)! Entered!! Obsessedddd with the fringe and your cute blue hat! Love how relaxed and comfy this look is. How I wish I could steal those boots from you too! I Did all above! 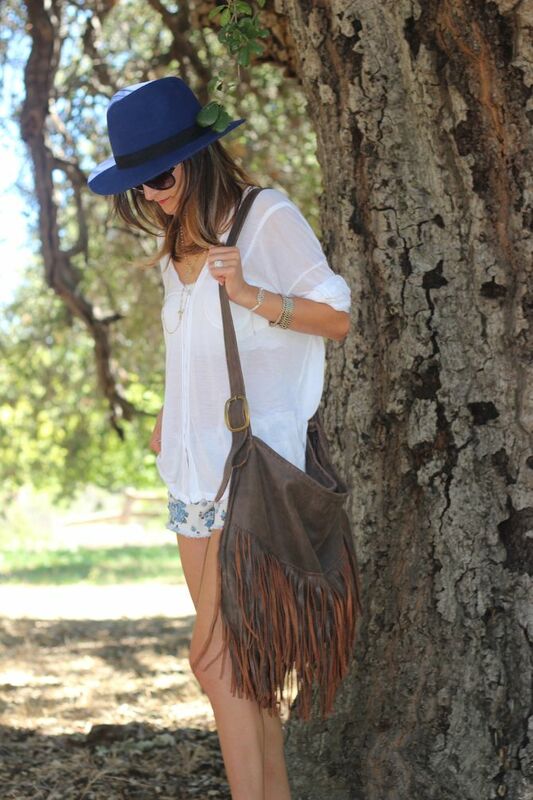 I love fringe and neeeed this bag!! Thanks for the great giveaway!! I've already liked and followed her on Facebook and Twitter. I would love to rock this bag on the reg. Thank you for the chance to dust my lucky four leaf clover off and win this purse! Followed you on GFC!! Winning!! Following you on the Twitter! Much love. I followed Jennifer Haley on Facebook and Twitter! I followed you on Instagram too :) Cute photographs! so cute! following on fb and instagram (unfortunately dont have a twitter). Okay better late than never: I'm following her on FB and Twitter. You know where to find me and you know this thing has my name written all over it: FRINGEARRIE. And I've been following you on GFC since baby days. And on twitter. Let's make a day of it and I'll follow you to the moon or something. Seriously coveting this amazing fringed bag-I NEED it to complete my summer/fall wardrobe! 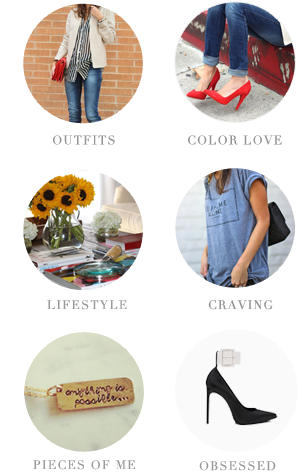 I love seeing your amazing style-thanks for sharing. Now following you and Jennifer on Twitter and have liked Jennifer's page on FB. Cheers! I was going to say that your outfit was perfect for a musical festival and then I saw what you wrote! I followed you on Instagram (@jacylenore)! great look! in love with the shorts!